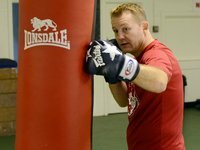 The "left jab, right cross" is another great boxing technique. 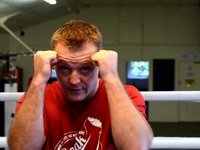 It is one of the first combinations taught in boxing training, and is viewed as a basic level technique, but once mastered, it can be fantastic. The "jab, cross" is all about sShow More traight lines, and economy of motion. 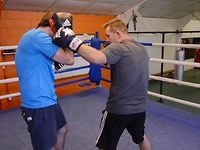 The jab is the nearest weapon to your opponent, and is thrown in a straight line from your chin, to your opposition's head (the quickest route possible). Whilst your jab is being pulled back to form your guard, the cross is released. This cross, like the jab, takes the quickest route available (a straight line), to land a power punch to their head. The jab is the ideal range finder - if you can make contact with the face, and you are quick enough, the cross should hit target too. 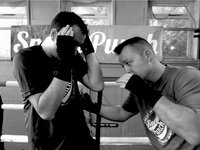 Here are some do's and don'ts for the jab, cross. • Don't get too enthusiastic, and lean over when throwing the right cross. This can leave you off balance, and open to counter shots. 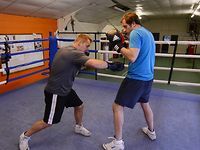 • Don't over-extend your elbow joints, on either the jab or the cross. This can cause damage to the elbow. 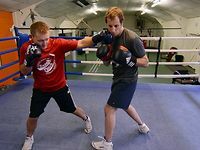 • Don't take your eyes off of your opponent when throwing the jab cross, or any combination. • Do stand up straight and tall when throwing the cross, as this helps you hit harder, and stops you from leaning over. • Do twist your hips when performing the right cross, and turn your back foot (on the ball) for that extra power. • Do keep your chin down, and tucked into your shoulder with this combination - protect yourself at all times. 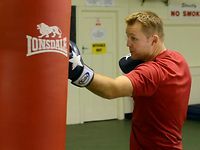 • Do practise relaxing when throwing all combinations - this should get you punching faster and harder. 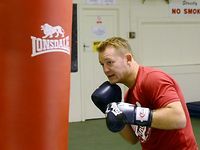 The "jab, cross" is an extremely important technique to master, and this means lots of practise. When training, concentrate on power, speed and variety of tempo, to mix it up.